(Phys.org)—In a new study, physicists at Penn State University have for the first time proposed a way to test a little-understood form of quantum mechanics called nonassociative quantum mechanics. So far, all other tests of quantum mechanics have dealt with the associative form, so the new test provides a way to explore this relatively obscure part of the theory. "Nonassociative quantum mechanics has been of mathematical interest for some time (and has recently shown up in certain models of String Theory), but it has been impossible to obtain a physical understanding," coauthor Martin Bojowald at Penn State told Phys.org. "We have developed methods which allow us to do just that, and found a first application with a characteristic and instructive result. One of the features that makes this setting interesting is that much of the usual mathematical toolkit of quantum mechanics is inapplicable." Standard quantum mechanics is considered associative because mathematically it obeys the associative property. 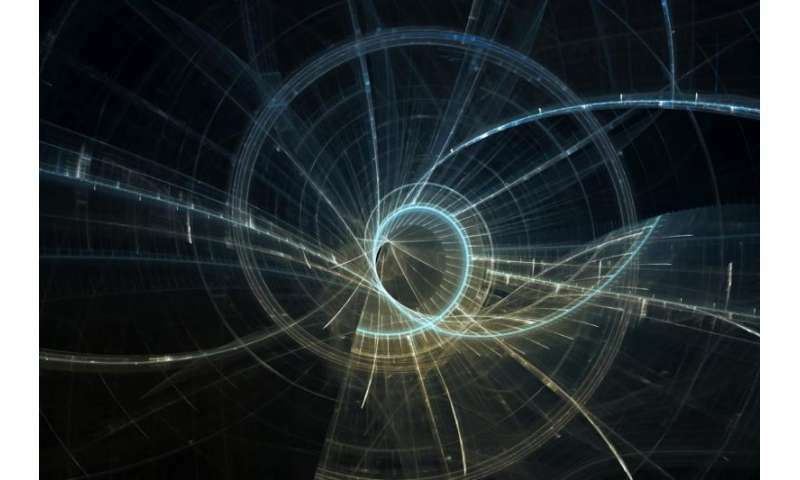 One of the fundamental concepts of standard quantum mechanics is the wave function, which gives the probability of finding a quantum system in a particular state. (The wave function is what determines the likelihood of Schrödinger's cat being dead or alive, before the box is opened.) Mathematically, wave functions are vectors, and the mathematical operations involving vectors and the operators that act on them always obey the associative property (AB)C=A(BC), where the way that the parentheses are set doesn't matter. However, a few exotic quantum systems cannot be represented by wave functions, and so do not obey the associative property but instead are described by nonassociative algebra. One example of a nonassociative quantum system is a group of magnetic monopoles, which are hypothetical magnetic particles that have only a north or a south pole, not both like ordinary magnets. In the new study, the physicists found theoretical evidence pointing to the existence of new, potentially observable, quantum effects that are not found in associative quantum mechanics. These new effects are predicted to cause a charged particle to move in a stable, circular motion in a situation where it otherwise would not in standard quantum mechanics. More specifically, this situation involves the combination of a magnetic field with a linear force. If there is only a magnetic field, stable circular motion is possible also in standard quantum mechanics, but the linear force disrupts this motion. With the nonassociative effect, there is a new force that can compensate for the external linear force, making it again possible to have stable circular motion. Although it would be difficult to experimentally realize a magnetic field containing monopoles (as monopoles may not even exist), the scientists hope that the effects predicted here may be tested in the not-so-distant future. "Fundamental monopoles are hypothetical, but there has recently been much research on constructing condensed matter systems consisting of quasi-particles which have properties similar to monopoles," said coauthor Suddhasattwa Brahma. "In this setting, our new predictions may well be testable. Our equations have to be analyzed in more detail in order to see what should happen in the presence of magnetic fields realized in this context, and how strong the new effects would then be. This process may take a few years, but not much longer." Overall, the results could lead to a better understanding of nonassociative quantum mechanics. One of the intriguing consequences of the nonassociative property in quantum mechanics is a "triple" uncertainty relation. "The usual uncertainty relation limits the precision of simultaneous measurements of position and momentum," said coauthor Umut Büyükçam. "The triple one limits the precision of simultaneous measurements of all three components of the momentum vector, provided there are magnetic monopoles. "Just as the standard uncertainty relation played an important role in the development of quantum mechanics, one can expect the triple uncertainty relation to be helpful in further improving our understanding of nonassociative quantum mechanics."